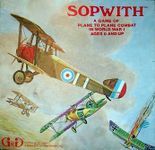 Take off in your trusty Fokker, Spad, Nieuport, or Sopwith Camel. Sideslip, turn, and fly straight into aces like Richthofen, Berthold, Rickenbacher, or von Hippel. Open fire, but hope your guns don't jam or run out of ammo. If you're damaged, fly into a storm cloud, or make a dash for a friendly aerodrome. When you too are an ace, you're shooting will be straighter, and you might even learn the tricky but effective Immelmann turn!